Approximately 16% of the adult population in the United States suffers from an overactive bladder (OAB). These patients experience urinary urgency often accompanied by urge incontinence, urinary frequency and excessive need to urinate at night (nocturia). At Alliance Urology Specialists, we offer a complete range of therapies to provide relief for patients with OAB. The most common treatment for OAB is a combination of antimuscarinic agents and behavioral therapy; however, approximately 20% of patients don’t respond to this option. For these people, other possible treatments include sacral neuromodulation (InterStim), botulinum toxin injection therapy, and a new minimally invasive therapy called percutaneous tibial nerve stimulation (PTNS). Multiple research studies have demonstrated the efficacy and safety of PTNS with objective and subjective success rates ranging between 50% and 80%. Alliance Urology Specialists was one of the few centers in the United States to perform a study comparing PTNS to extended-release Tolterodine 4mg, a common antimuscarinic drug used to treat incontinence. The final results demonstrated that the efficacy of PTNS was equal to Tolterodine 4mg and that the patient global response was higher with PTNS than with medication. This OAB treatment is performed in our office and usually takes only 30 to 45 minutes. Stimulation is delivered using a needle electrode which is gently placed in the leg above the medial malleolus, next to the tibial nerve. 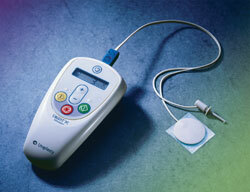 The Urgent PC stimulator delivers an electrical impulse that then travels to the sacral nerve plexus. During this process, the patient sits comfortably and only feels a gentle impulse in their distal foot and toes. Initial treatment sessions are scheduled weekly for 12 weeks. Patients who respond to PTNS usually do so in six to eight weeks. The treatment frequency is decreased after 12 weeks with a goal of maintaining the patient results with monthly, bi-monthly, or quarterly treatments.